Greens Senator Scott Ludlam last night called for the investigation and possible prosecution of politicians who led Australia into the Iraq war. 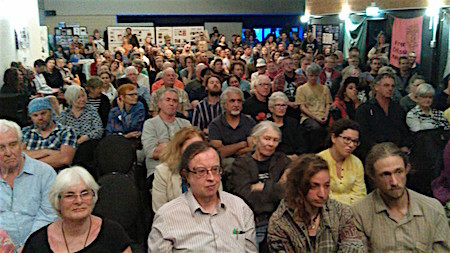 After describing the Australian Prime Minister’s office as one of “jointly operated outposts of the United States Government” he told a public forum about the Pine Gap spy base in Alice Springs: “Australia submitted to participating in an illegal invasion and occupation that has torn the region apart and paved the way for the emergence of Islamic State. “Hundreds of thousands of people died on that decision. The region is in meltdown and even the impending assault on Islamic State strongholds, everybody seems to agree, is likely to dramatically increase the risk of terrorism world-wide. 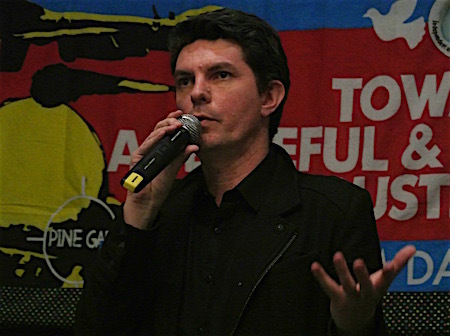 Senator Ludlam was addressing about 120 people in a public session of a week-long gathering of the Independent and Peaceful Australia Network (IPAN) during which several civil disobedience actions have taken place although the only charges laid were dismissed by the court. Senator Ludlam was scathing about the “self-imposed, almost automatic bipartisanship on anything of consequence that relates to national security and defence. “If it’s a Labor government you won’t get the Coalition to stand up and make impressive speeches about how no-one was consulted before they implanted a US Marine Corps facility in Darwin. He said other measures to disenfranchise the public included “neutralising” committee reports and “preventing enquiries from happening at all. “They can vote down motions or refuse to debate them altogether and there is a variety of ways to lock down Parliament’s normal oversight tools. “We can have an argument where the ADF buy their boots and that can be argued about for months and months. Sen Ludlum says the real power lies with the executive, with the agencies and the service branches “and doesn’t come anywhere near Parliament”. The Joint Committee on Defence and Security has no cross-benchers. When data retention was being debated it was “all blokes, an old boys committee … that has no operational oversight” contrary to the US system. Concerned with trade deals, trans-Pacific partnerships and defence commitments, “the Treaties Committee, where some of these agreements are signed, doesn’t get eyes-on until after they have been signed. “No member of the public has ever seen the legal instrument underpinning the US deployment into Darwin” although from that base the US can deploy forces “into war” into the region. US deployment into Darwin is now commonly accepted to be a base and “not a training or rotational anything”. While bases including Pine Gap exist “it’s impossible to have an independent foreign or defence policy. It’s simply not feasible”. Senator Ludlam put to the meeting “still sketchy thoughts” for a strong network of dedicated people to build trust and share expertise; to act on growing skepticism about the role of the United States “in setting our foreign and defence policies,” heightened by the possibility that “a narcissistic fascist is only one vote from the Oval Office. He suggested the introduction into the Australian Constitution of an Article 9 like the Japanese one forbidding armed aggression.